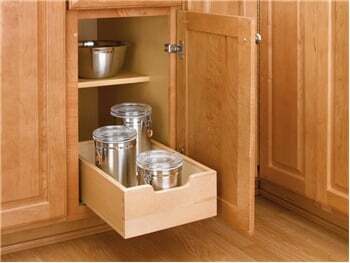 Wood pull-out organizers are a great way to keep your cabinets neat and easy to access. They pull out smoothly and safely from any size cabinet. Straining to grab items out of reach will become a thing of the past. When it comes to kitchen storage space, it's difficult to get everything stowed away in an accessible and organized manner. Sometimes, you just need a little bit more space. 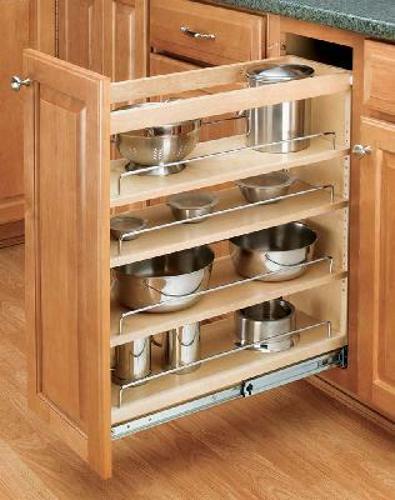 Fortunately, OVIS has the perfect kitchen storage solution: wood pull-out cabinet organizers. In most cases, it is impossible to take advantage of all of the space within a cabinet, because piling many kitchen items on top of each other without causing a mess is physically impossible. OVIS' wood pull-outs allow one to take advantage of all of the storage space within a kitchen cabinet, both vertically and horizontally. OVIS' stylish wood pull-outs not only look great, but they are made by top manufacturer Rev-A-Shelf with high quality materials and design. To learn more about OVIS' wood pull-out organizers, take a look at our selection online. You can also give us a call for assistance in finding the perfect storage solution for your home. 4-Tier Pull-Out that is beautifully finished with a clear coating to preserve the woods character and allow an acceptable match to nearly any cabinet. Three adjustable shelves. 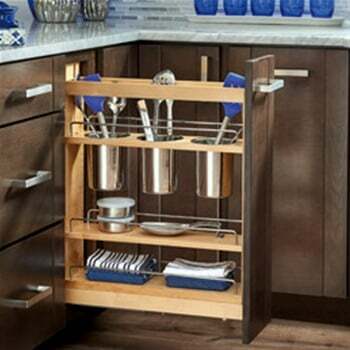 4-Tier Wood w/Chrome Rails Pull-Out Base Organizer with 19" Depth that features birch/maple construction and tri-slides Thre adjustable shelves allow flexibility of use. 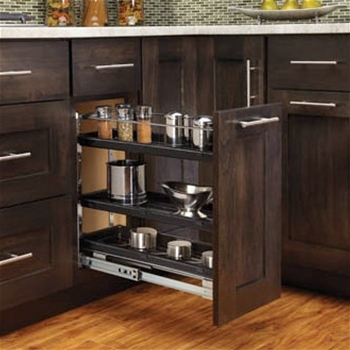 The 448 Spice Rack Insert is the perfect companion to the 448 Base Pull-Out Unit. Made from beautiful maple wood with a UV Clear Coat finish. 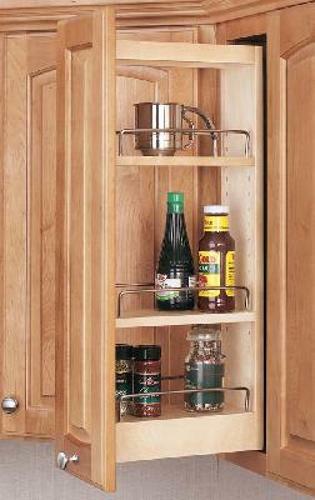 Pullout wall cabinet organizer with adjustable shelves that feature chrome rails. Full-extension ball bearing tri-slides. Adjustable door mount brackets. 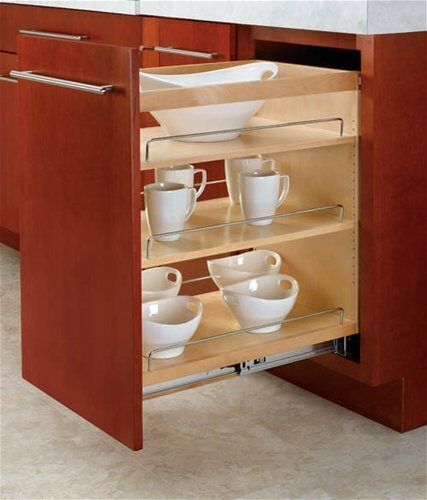 Pull-Out wall cabinet organizer with adjustable shelves that feature chrome rails. Full-extension ball bearing "patent pending" tri-slides. Adjustable door mount brackets. This dovetailed maple pull-out drawer/shelf will add functionality to your base cabinets and is sturdy enough for years of use. 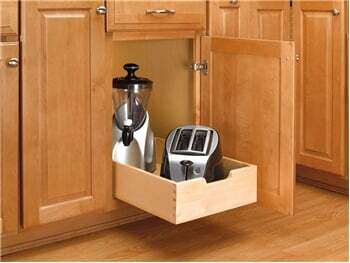 Designed for cabinets with a 12" wide opening. Dimensions: 11" wide x 18-1/2" long x 5-5/8" high. This dovetailed maple roll-out drawer/shelf will add functionality to your base cabinets and is sturdy enough for years of use. Designed for cabinets with a 15" wide opening. Dimensions: 14" wide x 22-1/2" long x 5-5/8" high. 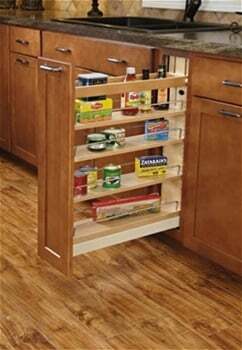 5 Inch Pullout Base Organizer with Full Extension-Soft Close Tri-Slides - Beautifully finished with a clear coating to preserve the woods character and allow an acceptable match to nearly any cabinets. Features: Adjustable Shelves with Chrome Railing. 8 Inch Pullout Base Organizer with Full Extension-Soft Close Tri-Slides - Beautifully finished with a clear coating to preserve the woods character and allow an acceptable match to nearly any cabinets. 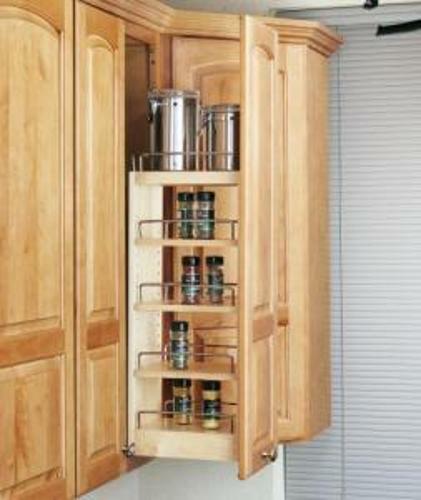 Features: Adjustable Shelves with Chrome Railing. 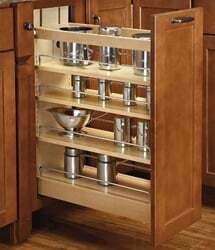 The Rev-a-Shelf 448UTSC-5C is a 5-1/2 Inch Pull-out Base Organizer with three stainless steel utensil organizers. It is beautifully finished with a clear coating to preserve the woods character and allows an acceptable math to nearly any cabinet. 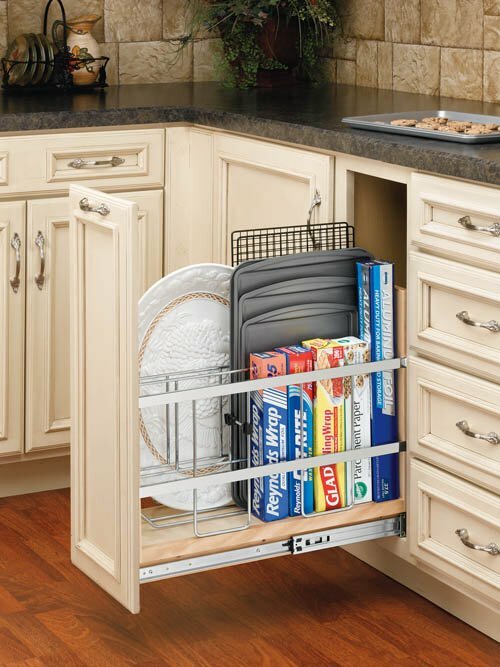 7-3/4 Inch Wide-Pull-Out Base Cabinet Organizer, Chrome & Black. This Chrome Base Organizer slides smoothly on our patented Tri-Slide system (with ball-bearing slides), and features 2 adjustable Black Polymer Shelves. 3-Tier Pull-Out that is beautifully finished with a clear coating to preserve the woods character and allow an acceptable match to nearly any cabinet. Three adjustable shelves. 6 Inch Pullout Base Organizer with Full Extension-Soft Close Blumotion Slides- Stop the noise, stop the madness from slamming cabinets with our innovative soft-close base organizers. These glide effortlessly on Blumoton soft-close slides and the concealed slide design is the utmost in cleanliness. Beautifully finished with a clear coating to preserve the woods character and allow an acceptable match to nearly any cabinets.